Very excited to see images of this church: my ancestor James Flint and his brother Benjamin migrated to Australia around 1860. James left Brighton when he joined the Royal Navy aged about 16, and served on HMS Odin during the Crimean War. His brother Ben was also a sailor. Their father was a soapmaker in Brighton and married his wife Lucy Sarah Pelling in this church. His first wife, who died in 1827 within the first year of marriage is buried possibly in this churchyard. Thank you for such a lovely site. I visited Brighton during August 2005 in search of information on my ancestors. I discovered that my great-uncle, Captain Fred Collins who owned the Skylark pleasure boat, was buried in the churchyard but I could not, unfortunately, find his tomb stone. Would the church have any records of his descendants? My mission is to find information on my grandfather, Edward Thomas Collins, who apparently assisted his uncle on the Skylark before leaving to join the Royal Engineers in the Anglo Boer War and World War I, whereafter he took his discharge in South Africa. I would love to locate any descendants of the Collins family – in this way possibly finding out more information on my grandfather, whom I never had the pleasure of meeting. My great great grand parents, William Boys & Harriett Emery, were married here on 2nd January 1837. They were from Alciston and Hurstpierpoint respectively. I believe that Tom was a relative, my family have talked about him for as long as I can remember. It would be nice if i could clarify this and have names of family that could go on our family tree. It was great to see this image. My great great grandparents and my great grandparents got married at this church. Tom Sayers was my 4th Great Uncle baptised at this church. His brother Charles was my 3x Great Grandfather. How wonderful to get a photo of this church. My great grandparents were married here on 4th April 1869. Does anyone remember them at all? They were William Henry Chapman and Harriett Finch. He was a young police constable in Brighton but only did 3 years service. He then reverted back to being a butcher and eventually died when he was only 26 years of age. They lived in Sloane Street. This page says that Capt Fred Collins, of the Skylark fame, who died in 1912, was buried in the churchyard but no trace could be found of his tomb stone. I have a paper that says that in the grave of his son, Frederick Poste Collins-Gillam, there is also a Frederick Philip Collins aged 79 years, interred 4th September 1912. The grave is in Brighton Cemetery (Woodvale?) and the grave number is R62 131/132. I would be grateful if you could clarify this. I am trying to trace my family history and wonder if you could assist me. My grandfather Charles Richard Bodle was christened in St Nicholas Church on May 17th 1868. His parents were Charles and Lucy Bodle. I would be very grateful for any help you could give. Wonderful to see St Nicholas Church. My great-grandparents, Richard Humphrey and Betsy Marchant were married at St Nicholas on 25/08/1855. Richard was a fisherman as was his father, William, before him. Their son George was my grandfather and he had 6 children by his first marriage to Rose, and my father, Richard Edward Humphrey, by his second marriage to Mary Ann Quelch, nee Hall. I’m sure that any old-established Brighton families with the name of Humphrey or Marchant must be related! My great great grandparents, John & Caroline Knight (nee Lock), were from Sussex. According to the census returns, John was from Brighton and Caroline from Eastbourne. I believe I have found their marriage on 6th December 1830 at St. Nicholas. It looks a beautiful old church – I plan a visit. My great-grandfather on my maternal side was married at this church on 8th April 1866. His name was William James Standing and she was Agnes Jane Samson. He lived at 14 Blackman Street and she lived at 1 Queen Street. Unfortunately she died in 1877. He then married again twice,first to Elizabeth Barnesand then Kate Upton. My great-great-grandparents were James and Elizabeth Puttock, apparently from Sussex. Their daughter Matilda Amelia Puttock married John Horn in St Nicholas Church on 20 March 1848 and Matilda’s sister Sarah Ann Puttock was a witness. I would appreciate any help in tracing this Puttock family. Many members of our family (Patching and Young) were baptised and married here. Henry Patching married Sarah Sams here in 1835. Could they be buried there? Also I am wondering if their son George born 1837 could be buried here? He died some time before 1882. I would appreciate any help in tracing information about this family. 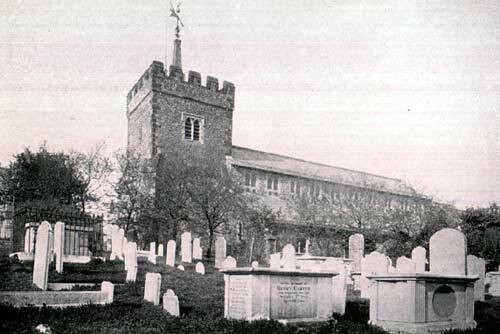 My great, great, great, great half uncle Frederick Goodacre Roberts was baptised at St Nicholas in 1860 son of Thomas and Esther Roberts, residence 16 West Hill Street, Brighton. After Esther died, Thomas married my great, great, great grandmother in London in 1864. In repy to the comment about Captain Frederick Collins last resting place. He is Buried in Woodvale Cemetary in Bear Road. His memorial has a stone anchor and lines from Tennyyson’s Crossing the Bar. It is located just below and to the left of the either the North Chapel or Lower Chapel. Sorry, I can not remember which. I also am a descendant of Captain Fred Collins, of Skylark fame, on my mother’s side. My mother’s Grandmother is Ann Gibbs, nee Simmonds, whose mother was May Elizabeth Collins. I am searching for my ancestors who I believe were buried at the church. The family lived at 43 Over Street in the 1850s/60s. My great great grandfather died 25th December 1859 and his daughter Eliza died about 1863, their name was Worthington. My great great grandmother was called Harriet Martin, married Thomas Worthington around 1850-1854 but I cannot find any record of their marriage. Are the b.m.d records still kept at the church? My ancestor, Joseph Vickery, married Mary Russel on 11th December 1799 in St Nicholas church and their twins, Joseph and Mary Vickery, were baptised there on 10th October 1803. I would love to find out more about these people..can anyone help? Where can I look at records from the church’s births, deaths and marriages? For some unknown reason I haven’t visited the site for a while, perhaps due to the fact that I’ve been researching my family for months on end. It was nice to see the message from John Baker giving me the number of Capt Fred Collins’ grave at Woodvale Cemetery and I will certainly pay it a visit on my next visit to Brighton, hopefully mid 2008. Also nice to get details from Faith Prince….thank you. As Tracey Hume is also related to Fred Collins we would most certainly be related distantly as well. It would be lovely to hear from her personally as she may well be able to help me trace further back in the family. My great great great great grandfather, Richard Towner, was married at this church to Sarah on 2nd May 1847. And my great great great grandmother, Mary Ann Towner, one of his daughters, was christened there also, along with her sister, Sarah, on 30th August 1846. Capt. Collins fathered an illegitimate daughter in 1880 – my maternal grandmother, so I guess I am related to those people who mentioned him as an ancestor. Tom Sayers, buried at Highgate Cemetery, was my 4th great Uncle. Name was changed by the family when emigrating to America. Would like to explore more details of the family tree. Hi there. To all of people who mentioned their connection to the family of Capt Fred Collins, I would love it if you would contact me on joanbooysen@absamail.co.za. I am researching the family tree and it would be great to get some more info. Capt Collins was my granddad’s father’s brother and am I desperate to find out as much as possible before my next visit to Brighton. Thanks so much and best regards. My great great grandparents were married at St Nicholas on 12th August, 1845. They were John William Poulter & Caroline Atherton. It is lovely to see a photo of the church! Great to see the Church where my great-grandmother Julia Mary and her twin sister Charlotte Amelia Elphinston were christened in June 1846. My GG grandmother was Mary Emery, who was the sister to Harriet Emery who married William Boys mentioned in the post by Allen Curtis. Would like to make contact if possible. I have just seen my Grandparents’ Marriage certificate. Henry Gardiner (24) married Florence Hayward Martin (25) at this church on 22 September 1903. Beautiful interior photos. My great-great grandparents, Richard Woodward and Mary Stewart were married here in 1845. I learned from an earlier entry that my great-grandfather, William James Standing was married to Agnes James Samson in this church in 1866. He later married Kate Elizabeth Upton, who was my great-grandmother, in 1892 at Brighton Registry Office. Thank you Edward Charles Bozier Stoner for this information. So it would appear that you and I are 3rd cousins! I would love to hear about any other Standing family information you may have. Regarding Pamela’s post, North Street still exists, however the White Lion Inn (tap yard and stables) does not. This pub was at the top of West Street and was apparently demolished in about 1875. I have just come back from the funeral of Henry Allingham, the oldest man in the World for a few weeks at 113 years of age. It was a really wonderful service and I felt as if I was part of history. R.I.P Henry. Many of my ancestors were baptised and married in St Nicholas’s. The 1800-1801 Brighthelmstone Directory shows the brother of my 4x great grandfather, Hezekiah (Hezechiah) Stiles (Styles) as a Grocer and Cheesemonger in West Cliff. My great great grandmother Elizabeth Billage of Cambridge was married in this church on 23rd December 1848 to the 7th Earl of Stamford and Warrington. Their daughter Ellen Susan Grey Billage was born before they could marry so was never legitimate and we could not inherit the title, which has now died out. My Great-Great Grandparents Charles Hitchings and Mary Ann Reed were married in St Nicholas church in 1850 and my great grandmother Catherine Hichings was christened in St Nicholas in 1859 along with all her brothers and sisters. The Hitchings lived in Brighton all their life. My great great grandparents, Robert Scroggins and Maria Whiting, were married in this church in 1863. Robert was from Badingham, Suffolk, and Maria was a native of Brighton. My Great Grandfather James Glanville Kidney (born 1855) lived at 6 Over Street in Brighton in the 1860s. Three of his sisters Mary Jane Glanville Kidney, Elizabeth Harriet Glanville Kidney, and Louisa Glanville Kidney were all baptised on 26 October 1867 at St Nicholas Church. It’s great to see this website about the church. If anyone has any information about my relatives or their descendants, I’d love to hear from them. joannemdavies@yahoo.co.uk. 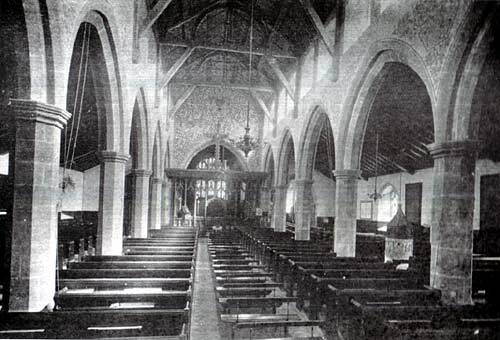 As I live in Wales it was lovely to see an old picture of the church my Great Grandfather was married in. His name was Robert Kew (1808) and he married a Sarah Ryder on the 9th June 1836. It is said that she was a straw hat maker and her father was a clergyman. I am trying to find more about Sarah Ryder’s family. My great great grandmother Jane Shorter, from Salehurst in Sussex, married John Hubbard Denman at St. Nicholas church on 4 May 1836. John left his home of Hurstpierpoint from about 1815 – 1820, to cash in on the building boom down in Brighton. In the early years, he and Jane lived in Foundry Street, near Brighton station. John was a builder, (bricklayer & plasterer) and was was working on building projects in central Brighton. Foundry street and other North Laine streets were not yet connected to any sewers, and there was overcrowding. Jane died of T.B. aged 36, in 1849, leaving a 1 year old son called James, who died a few days later, also of T.B. Jane and her baby James were buried together on Sep 9th 1849, at St. Nicholas. My great great grandfather (re. my above comment), Plasterer, John Hubbard Denman, who married Jane Shorter at St. Nicholas, had two other sons when Jane died. They were 4 and 6, and were John William, born in Tidy Street, Brighton, Dec 1842, and Alfred Michael, born at 102 Trafalgar Street, Brighton, Dec 1845. John Hubbard Denman married again, at St. Nicholas church in 1851, to Lucy Tugwell, who was a doctor’s servant and housemaid, and who lived-in at 13 Devonshire Place, Brighton (Dr. D. Maitland?) at the time of their marriage on 10 April 1851. Joseph Vicary and Mary Russell are also on my family tree, perhaps Hazel Hunter could contact me – please. Re a comment of mine above dated 24/11/2012: I’ve just discovered that the St. Nicholas Church I thought my ancestors Jane Shorter and John Hubbard Denman were married in is not correct. The date is right (1836) and the parish of St. Nics is correct – but the actual church they married in was the “church of ease” for St. Nicholas – the “Chapel Royal”, at the bottom of the hill. (A “church of ease” is a church deemed by an act of parliament to be an easier church to attend for some parishioners, than the regular church of the same parish.) Apparently in this case, the Prince Regent had the Chapel Royal built in the parish of St. Nicholas, because “St. Nics” became a struggle for him to get to – up the very steep hill from the bottom of town where he was living in his farmhouse. Perhaps my family couldn’t be bothered to get up the hill either! Still hoping that one day I will be able to make contact with Hazel Hunter (see 11/11/2007 comment above). Is the list of burials that SNCGSA produced available to view on line ? Jesse Neaves (Neve) and Philadelphia Harriott married at St Nicholas, Brighton, on 27 October 1849. He was a Sawyer born 1829 in Withyham, Sussex, living at 20 Frederick Place, Brighton. She was born 1822 in Patcham, Brighton, living at 10 Terminus St, Brighton. They both signed the certificate with X. After the marriage they lived at 7 Regent Hill, then 4 Lime St (off New Dorset St). Seven of their nine children were baptised in St Nicholas. They were my G. G. G. Grandparents. Why ‘Philadelphia’, Gwen? Just curious! I am also a descendant of Elizabeth Billage who married George Harry Grey, 7th Earl of Stamford, at St Nicholas Church in Brighton. I am interested in contacting the descendants of their grandson, George Harry Grey Nixson.